Cub sized Metallic Gold Hip Dots plastic gift bags are made of 3 mil frosted clear plastic and feature large metallic gold polka dots. Bags measure 8x4x10" and are sold in a bulk carton of 25. 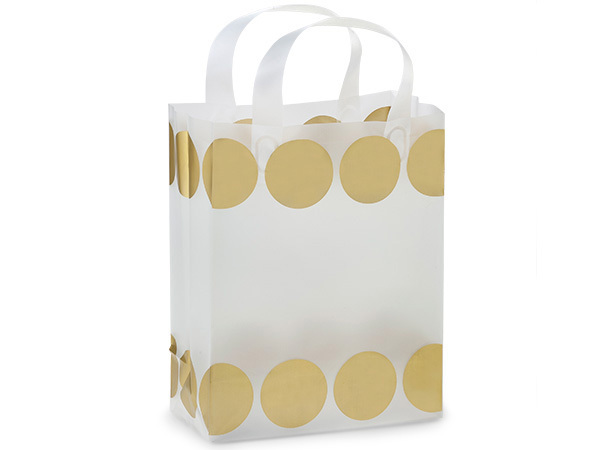 Our exclusive, popular Hip Dots Plastic Gift Bags are made from frosted clear 3 mil hi-density polyethylene with matching 6 mil soft loop handles and bottom inserts for stability. Available in many sizes in bulk or small packs.